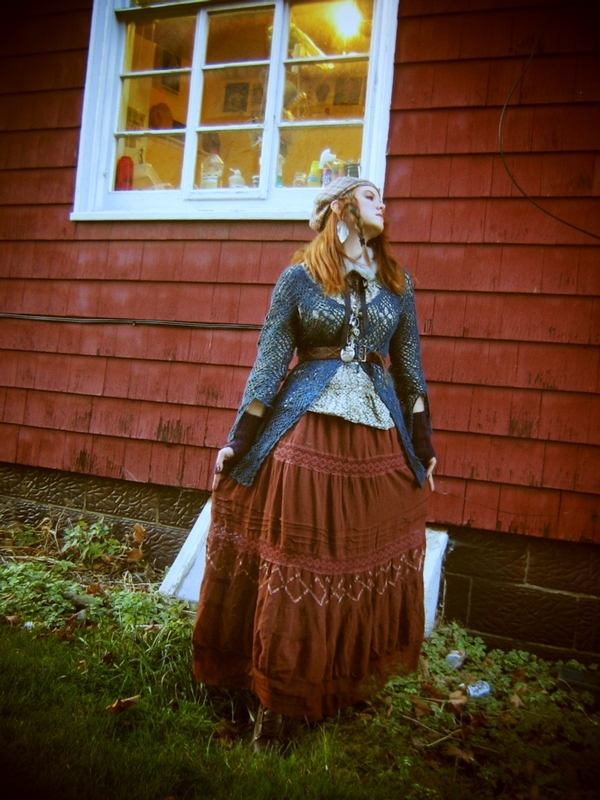 I have a massive file of fashion inspiration on my computer, filled with everything from Buffy, Veronica Mars, and Legend of the Seeker screencaps to gothwear to rockabilly to 1940s high fashion to my favourite fashion bloggers to pictures of Amanda Palmer and Joanna Newsom. One fashion subculture that keeps turning up is mori-girl, a somewhat recent style out of Japan. The name means "forest girl", and the style is largely comprised of layers of soft, comfortable, loose-fitting clothes in naturalistic, rich colours, with a lot of quirky details and natural materials. A lot of mori-girl outfits are very folklore-y in aesthetic, which definitely appeals to me, and I also see a lot of asymmetrical layers and uneven hems, yay! (For a nice visual overview, check out this mori-girl Tumblr -- lots of gorgeous photographs.) I've fallen quite in love, and finally decided to have my first go at putting together a mori-girl inspired outfit. I'm sure I haven't got it exactly right, but I like the result. 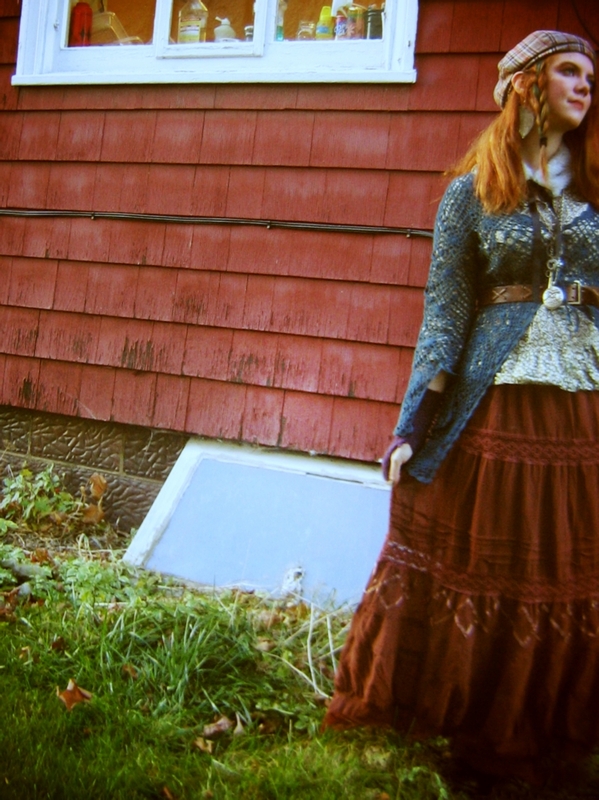 These are largely things that have been in my closet for some time, though I'd bought the skirt at Goodwill when we had family visiting and apparently forgot about it because I don't think I've worn it more than once, which is shameful, because look how gorgeous! 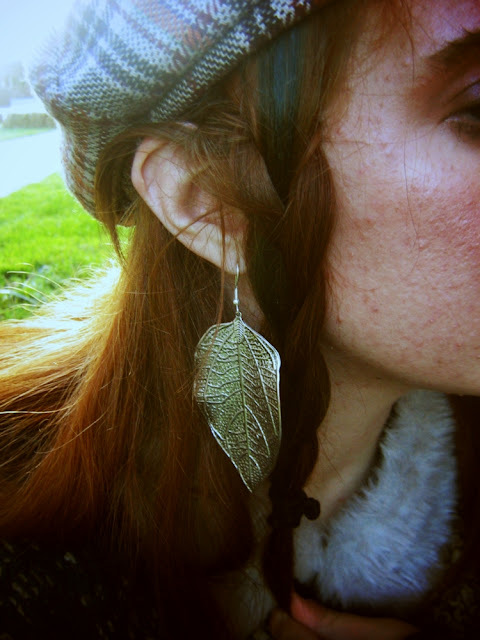 Leaf earrings from a Rue 21 clearance rack; they were just a little too neat, so I bent them up a bit and like them ever so much better now. Hat from Rue 21, several years ago. And my Hot Topic fur collar, which is probably the best three dollars I've ever spent on myself, the amount of use it's getting. I bought myself two warm pairs of knitted fingerless gloves at Ross Dress For Less recently (three dollars each for gloves that originally retailed for eighteen; not bad, I say! ), as while I have lots of fingerless gloves, my only really warm ones are orange, and clash with a lot of things. So I've these lovely long purple ones (I may sew some buttons onto them later), and a grey pair with bows which will undoubtedly be seen later. 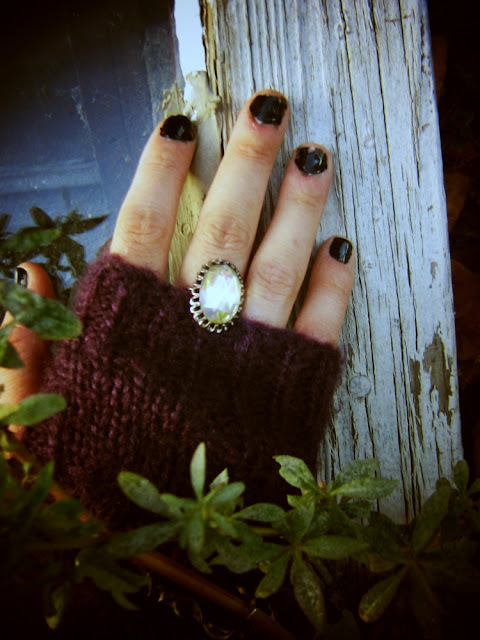 The ring was twenty-five cents at a yard sale. 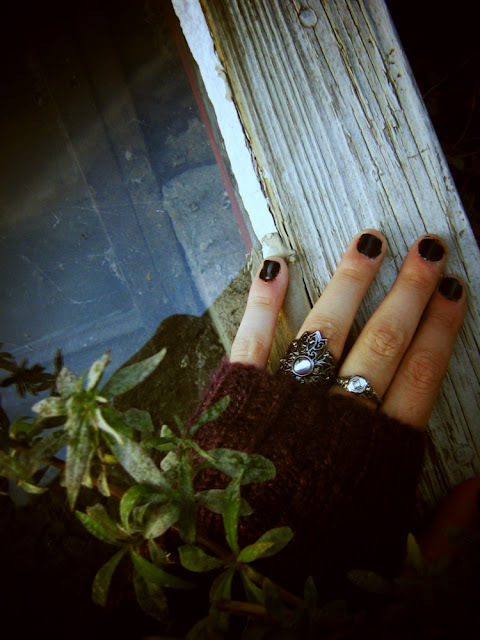 The first ring is from Rue 21, and the other, which I wear all the time, is my great-grandmother's engagement ring, from the 1920s. It's extremely beautiful and intricate with a tiny chip of diamond; I'll have to take some proper pictures of it someday. 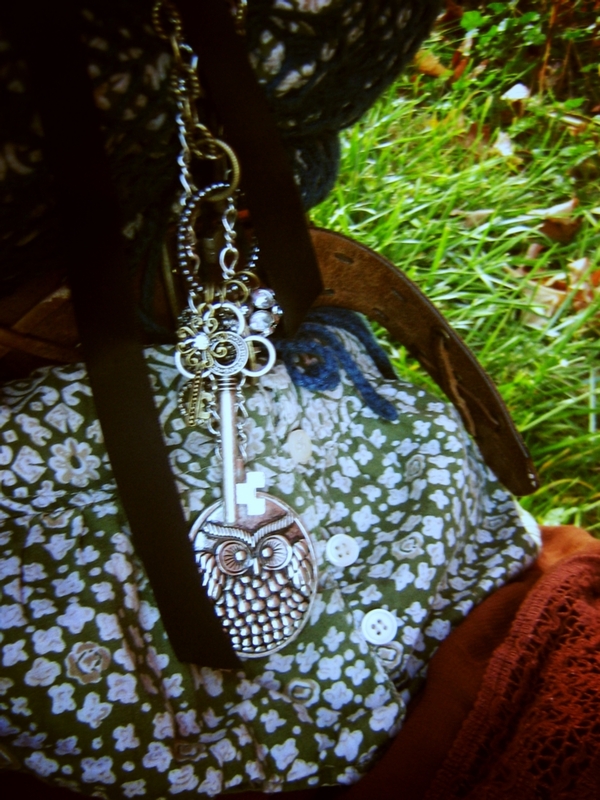 My owl necklace from Kyra, and a lovely jumble-of-keys necklace from Rue 21. Cosy purple socks! 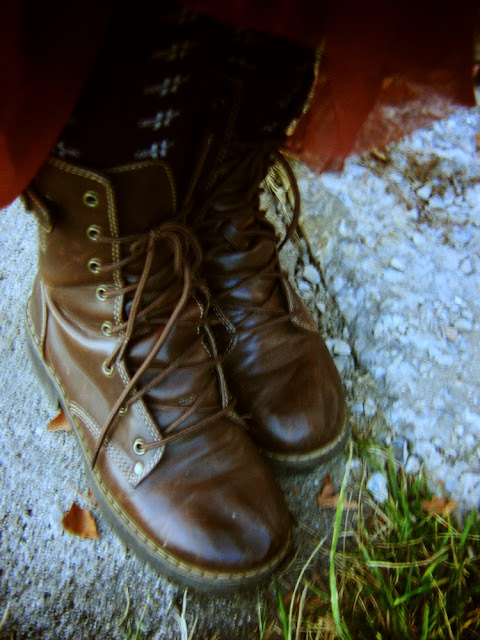 And yes, I do wear these boots almost every other day. As I type this, my hair is up in a shower cap and full of dye, so I'll be a new(ish) me tomorrow, good heavens.